Crisis of inadequate access to drinking water is a widespread problem across the world, affecting the well-being of millions. Globally, waterborne diseases caused by lack of safe drinking water and sanitation facilities kill more young children than AIDS, malaria and measles combined. It is estimated that 884 million people lack access to safe water worldwide. In India, despite considerable allocations of financial resources for drinking water facilities by the government, large number of people still suffer the burden of water scarcity and water borne diseases. 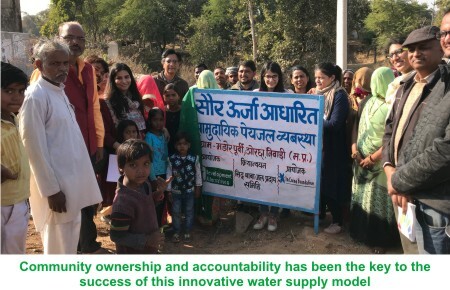 Community Owned and Community Operated (COCO) Model for safe water supply started operations in the village of Madore in Orchha in November, 2018. Madore is home to a population of about three thousand people. The village is situated on a hilly terrain and so the problem of water shortage that plagues much of the drought prone Bundelkhand region is exacerbated here because of this and owing to the lack of appropriate infrastructure to carry water to a high altitude. This water shortage manifested itself in different ways such as the drudgery of women who had to walk to distant sources to collect water daily and compromised sanitation behaviour amongst the community. In the COCO model, drinking water is drawn from a ground water source by a solar-powered motor, which is carried by a pipeline to a water tank in the village. A pipeline is installed and community stand-post taps are connected for the use by three households per stand-post. Each household made a contribution of INR 1,000 to create a common pool of funds for the construction of the water tank. The community contributed their labour for the construction of the system. A maintenance fee of INR 50 per month is collected from each household. This fee serves to cover the cost of four households that cannot afford this monthly expense. A village water committee comprising of both men and women has been formed to ensure the fair operation and utilisa tion of the system. The committee has appointed an operator for the system and decisions on spending funds from the collective maintenance fund are taken by the committee. 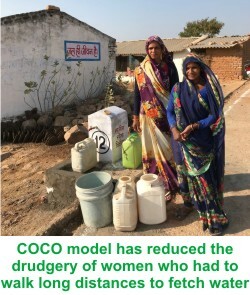 The use of a solar pump in the COCO model is beneficial in many ways. As the source of energy is the sun, there are no running costs or fuel costs and also the system is not dependent on power supply which is often erratic in the region. The model is also environment friendly as there are no carbon emissions. Moreover, it is easy to maintain and operate and local youth or women can be trained on the same. As the community itself owns and operates the system, there is ownership of the system that results in effective maintenance of the infrastructure. Also, as the operation of the system is undertaken by members of the community, there is true accountability for efficient supply of water to the households. The residents of Madore are excited about finally getting access to safe drinking water and the word is likely to spread further to possibly inspire more villages in their area to adopt the COCO model. The community in Madore first heard about the COCO model from a similar model that was operational in a neighbouring tribal hamlet. But after taking inspiration from elsewhere, they improved upon what they had seen by constructing a cement tank instead of a plastic one so as to increase the strength and longevity of the system.